“Three weeks?! Is that all?” they laughed uproariously, as a response to my telling folks at a dinner party the other night about how much trouble I was having finding things like sinks, tiles, light fixtures, and so forth, for the renovations of my apartment. I literally spent weeks and weeks combing plumbing catalogs, scoping out a myriad of stores devoted to kitchen fixtures, and relying heavily on our friend, the internet, in search of a plain, large, white sink. I don’t want swoops and swirls, (and I only have one more Ikea visit left in me, and I’m banking that for something really important) – I want a generous basin that’s large enough to hold a few pots and pans. And I’m not interested in a purple or green one. You wouldn’t think it would be all that hard – and neither did I – but after three solid weeks (and I mean, twenty-one days and twenty-one nights), I finally found one in France. The only problem? It was in Lille. As I’ve shown many friends here, tout est possible, so we decided to make a day trip up to the city in the North, just a few hours from Paris, and while there, eat some of the local fare. Because things are so frantic right now — imagine if I took me three weeks to find a sink…then I really need to get cracking on a toilet, a towel bar, kitchen cabinet handles, a soap dish, and light bulbs — so I don’t have a huge amount of time. But there’s always time for Merveilleux, a chocolate-flecked pastry stacked with meringue and cream inside, and les gaufres (waffles), another specialty of Lille. After picking up my sink and hiding it in the trunk under a blanket (…yes, I’ve learned how valuable these things are…) we hit the Sunday Marché de Vieux-Lille. The outside had the usual folks selling clothing with way too many buckles, zippers, and pleats, bins of plastic housewares, and tube socks, but inside was a nice market with a few local bakeries and some tasty looking charcuterie hanging from the rafters. 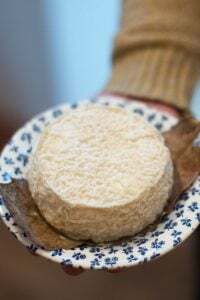 I picked up a bag of les gaufres filled with chicory cream. Romain couldn’t eat them because they were so sugary. But I made my way through one before my sweet tooth started aching. We would have gone to Aux Merveilleux de Fred, but the line was down the block and I wanted some moules-frites. 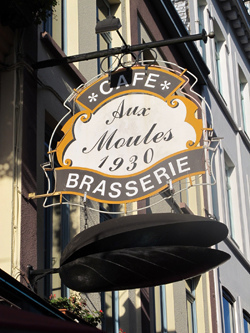 A local had told us that Aux Moules was a good place to go, and after assuring us it wasn’t a tourist trap, we found our way over there and happily discovered a charming brasserie with beer bottles lined up on the bar, and a place filled with locals on a brisk, chilly Sunday afternoon. One thing that struck me immediately was the open kitchen and how happy and friendly the guys in the kitchen were. When you live in a city like Paris, you get used to people being a bit stressed out and frantic. Kinda like the person I see in the mirror every morning. And it’s easy to get the impression that Paris=France, so it’s important to get out of the city for a while to see the rest of the country, where people are open and relaxed, including me. We both ordered mussels with “escargot butter”, which my dining companion didn’t quite understand. “Daveed, je ne comprends pas….” he said, not sure what to make of butter that is supposed to be served with snails, but with mussels instead. (But that’s okay, because I was still scratching my head over all the people at the café on the autoroute, complaining that the coffee was too strong.) 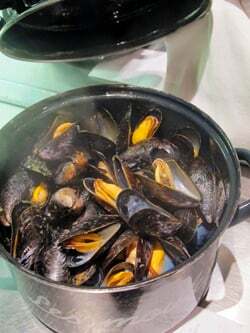 Yet he got over it when they brought two generous pots of steaming mussels with green-tinged butter, accented with probably the right amount of garlic for les Parisiens. But for les Provençales, and one American, a few more cloves would’ve kept those pesky snails back where they belong, for good. 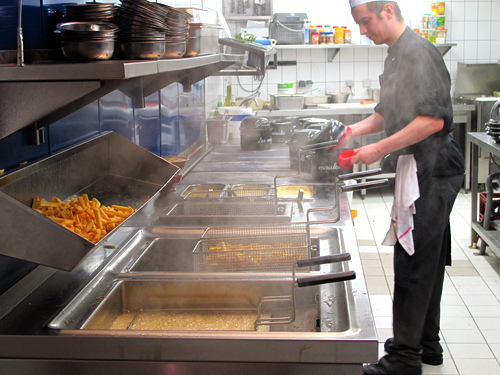 I was really intrigued by the open kitchen where they were cooking in full view of the guests, and the big fryer. And had to get up, say hi, and take a better look. These guys were really the masters of les frites. I mean, check out that set-up! Okay, they weren’t the best frites I’ve ever had, which makes me ask why is it so hard to find restaurants that use fresh potatoes for their frites, in a country where Parmentier, a man revered for saving France, even has a métro station named after him? But I suppose I would need a few weeks to figure that one out as well. And as I now know, it should take at least three. So after Romain and I scraped our marmites à moules clean, wiping the last bit of sauce out of the bottom of the pots, and made sure there wasn’t any wine left in the carafe, we split a tarte au sucre bathed in brown sugar sauce. Then, high on sugar, we made our way back to the car. With the winter sun setting at our backs, our bellies full of moules, frites, waffles, and les merveilleux, we headed back to Paris, with a new sink securely in tow. Would someone rob you off your sink? A few hours drive to get a plain white sink is nothing compared to more than half a year to get your new apartment. Of course here in Singapore you’ll probably get the same sink in less than half a day. You win some you lose some. Am loving your current adventure to prepare your new place. I suspect it will bring you places further away than Lille. Ah moules frites! It’s true the frites, I only know of two or three places that do their own in Nantes. One of then is a late night kebab joint that I frequent specifically to support homemade fries, even though the kebabs are meh. It’s a change from when I lived in London, where almost every kebab had homemade fries. In September, Lille has a great a festival in September as know : la foire de Lille. Most of the store offer great discount and the best is a competition among the restaurant of who selling the most of mussels dishes. And they expose the empty shells in front of the restaurant door. The bigger the mount Will qualified the winner. It is one of the greatest time to be in Lille, the weather is warm and the terrace of the cafe are full…..
Congratulations with your new sink! Great post. Are these blood sausages on the picture? If blood sausage is a French specialty- like in some other countries UK, Spain, Estonia – would be interesting to read something about the French blood sausages. This is a controversial topic clearly dividing people into love or hate legions. Can’t wait to see the sink. I am spending tons of time on the Le Bon Coin website and found some great items already. I like le Bon Coin, but in my experience, folks aren’t so great at wrapping things securely for shipping and I recently bought something that was large – and relatively fragile – and it arrived completely smashed because it was just put in a box and sealed with tape. Even the post office folks were surprised, and told me not to accept it & they would send it back. So I’ve gotten cautious and only buy things that I can pick up in person. I wanted a deep plain white ceramic tub for the laundry and was surprised how difficult they were to come by. Miraculously, after months of just keeping an eye out for one, the perfect thing appeared one day at my local brico – on special! And I talked them into a further discount because there was a tiny black scuff mark on it! But what does the sink look like??! Le Bon Coin is great! Our freezer gave up the ghost a few months ago, I noticed around noon, checked Le Bon Coin, and replaced it with a much better one for 60 euros in about an hour and a half. I wouldn’t buy something if I couldn’t see it first though, there’s no protection like with Ebay and such. Oh and don’t buy bicycles from it; they’re almost invariably stolen. Congrats on the new sink David! My those cakes look nice. When we bought our present house, the sink was tiny. I mean, who wants a sink that you can’t even wash an oven rack in? We also had to hunt high and low for what we wanted, a double sink with two decent sized bowls. It was actually easier and cheaper to pay for a ticket for someone to bring them over in luggage! My MIL had a plain white, single bowl, 36″ kitchen sink and I loved it. I could wash the largest roasting pan, do laundry in it and bathe my babies..it was so handy. Could I find one when we remodeled our kitchen? NO..except in stainless, which I didn’t want..and even that was only 30 inches. Since the farm house sink, the one with the porcelain face, has become a popular kitchen feature single bowl sinks are getting easier to find. When we remodeled, all you could find were a couple dozen versions of a double bowl sink. I chose one with a small disposer bowl and a larger, deeper main bowl. It’s still too short for my longest roasting pan. Grrrrr. One of these days, when we get a counter upgrade, I’ll get the one I want even if I have to drive to the country for it! Road trips are always fun! Wait, something is clearly missing from this post. Where’s the picture of the sink? 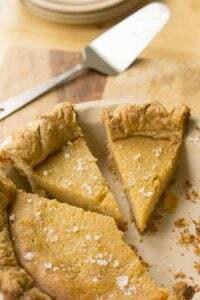 Tarte au sucre! My grandmother used to make that — though hers looked a bit smoother. Was the top of yours crunchy or just browned? I’m intensely curious. Yes, I also scrolled down looking for a picture of the sink…we want to see it before installation and then after! I wonder if a Fr restaurant supply store would have the sink you want? Eurotra 119 bvd Richard Lenoir has lots of interesting stuff. Now I HAVE to go to Lille! 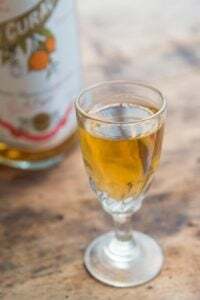 Do you have a recipe to make les merveilleux at home? Eileen, Susie, + nicky: No pictures because the sink is now in my safe-deposit box! 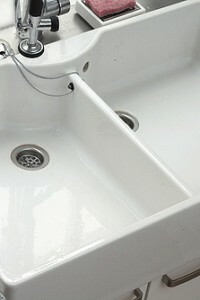 sandra + susan: I was quite shocked at how much sinks are in the UK, where they have the big basin ones. Was tempted to go there and bring one home myself – luckily I found mine. Looks like the trip was well worth it. Those large waffles look crispy and delicious! No photo of the sink?!? 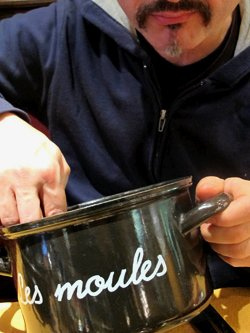 Next time you need a sink in Lille, I’ll send you to a much better place than Les Moules…glad you got your sink though! I am fascinated by your trip. It appears Lille has everything including the kitchen sink (pun totally intended). Those waffles sent me on some sort of salivating downward spiral. I lost control there for a minute. Why, WHY have I never seen a waffle like this? 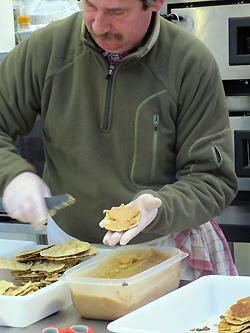 Great article and yes, les gaufres look divine!! What is it with all those buckles and zippers? It’s hard to get to the waffles and mussels. I’m still working on the pastry with meringue and cream. Oh wish I could have whisked you to Portland (Oregon) for your sink needs. We remodeled our kitchen a few years ago (so I could teach my cooking classes from home) and I found exactly what I think you must have been looking for, for $30 at a wonderful institution called the Rebuilding Center. Sounds like your trip made it worthwhile though. . . glad you found something you liked. Claudia: I’m not sure. It was like when “whiskers” (those creased lines on jeans, radiating out from the crotch) were all the rage. I didn’t get it..
Ahhh… the SACRAFICES you have to make. For a sink. My heart is bleeding over here David. Bleeding. David,I apologize for asking if you were allowed to renovate your rented kitchen as I now clicked on apartment and was able to read of your purchase,I always enjoy reading your writings and share them but I have to be careful as they usually go into my junk mail.I also liked and shared your morning walk/ food shopping video and just wanted to know if you are planning to more as well as cooking demonstrations,not that I expect answers but some acknowledgement would be nice sometime as you have been a nice line to of my loveliest cities and how to have your writings come to my email not junk mail? Oh, marveilleux! This is why we love the French and forgive them their faults (even scarcity of proper sinks. 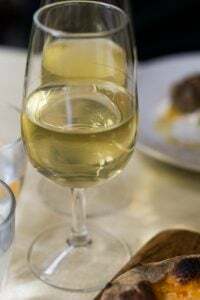 hi david… brilliant post as always… my mouth is watering..surely a stop on my nxt visit over to france… i wish we lived closer… i have a fabulous white sink that i purchased from france… sitting in my garage here in seattle! David, why is it that you always post the most beautiful pictures of sweets when it’s a gym day for me?! That tarte au sucre!!! And I don’t even have a sweet tooth! it’s just so unjust….. I started a light-hearted ‘jeune’ yesterday and am now salivating over my keyboard!!! Before starting the fast, went eating in the 14th on Sunday and had – I think – the first real, hand-made, properly cooked fries since we moved to France…. Sometimes when I can’t stand it any longer, I go for some MacDo’s – never ever had anything else but the fries and in an earlier life the hot apple thingie…. We have a huge stone sink in the garden on our patio…. what a waste – and yet, I’m thankful that the previous owners have kept it. Can’t use it though, as the water would go directly into the soil so neither detergents nor BBQ debris must go there and it’s blocked up anyway. I would have loved to give it to you. 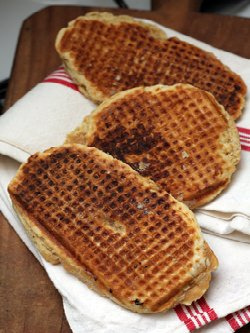 The waffles are not a specialty of Lille, the waffles are a specialty of Belgium. That you eat in Lille called for waffles and they are known because they were highly appreciated by General de Gaulle. 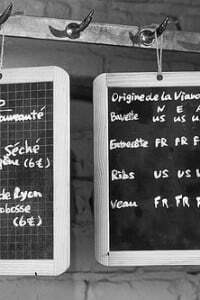 In the district of “Vieux Lille”, there is a cake – tea room upscale called Meert. It is in this pastry that General had bought his waffles. If you come back you walk on Lille, one must visit the “Wazemmes market”. This market is held every Tuesday, Thursday and Sunday. It is a market with lots of Arab products. It’s very friendly and there are fruits and exotic vegetables all the year at prices very low. It’s funny that you associate pastry “Fred” and the Merveilleux. If you want to eat a real Merveilleux, go buy it in pastry “Le Merveilleux” go eat at “café Méo” which also sells Merveilleux pastry “Le Merveilleux”. 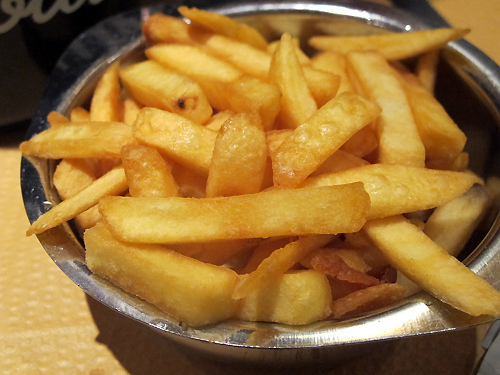 Also, be aware that fries you eat in the north, home to Lille for example, do not necessarily like fries with that you can eat elsewhere in France, in Paris for example. With us, they are a bit thick, cooked in fat, not too cooked precisely. And we love the water with vinegar before serving. From your photos, I see that you are passed along Villeneuve d’Ascq (mills on your photos). I lived there almost 10 years. If you come back to Lille, you can stop you there and visit the LAM (Museum of Modern Art), which is beautiful and rich in many works fantastic. I do not know if you speak French then to make myself understood, I translated what I had to tell you with the help of translation software. I’m sorry if this is not very understandable, I’m too English to write anywhere without the help of this translator. We look forward to meet you on occasion, to be able to show you around my beautiful region (and at the same time, work a little English!). David: I would love a recipe for this beautiful cake. Would you have one or know where I can get one? Charlie: There’s one in the Joe Beef cookbook, which was one of my favorite cookbooks of 2011. Elodie: We did go to the Villeneuve d’Ascq modern art museum and it was great. Sandy: I am planning more videos, but they take time and a lot of effort, especially on behalf of the person who shoots them with me. But I do plan more. Looks like you had a good time. Lille is a nice place to visit. The people are provincial – ie friendly! Did you not want to risk L’Huitiere? All the food I ‘ve had there was very good. It does sometimes get a bit surrounded by photgraphing tourists, but thats not their fault, it was just built like that. Glad the works are ripping along. @ Sandy, Try adding David’s web address to your email contacts. 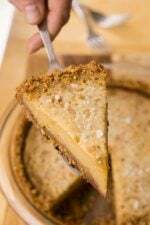 Does anybody have a recipe for the tarte au sucre with the brown sugar sauce? 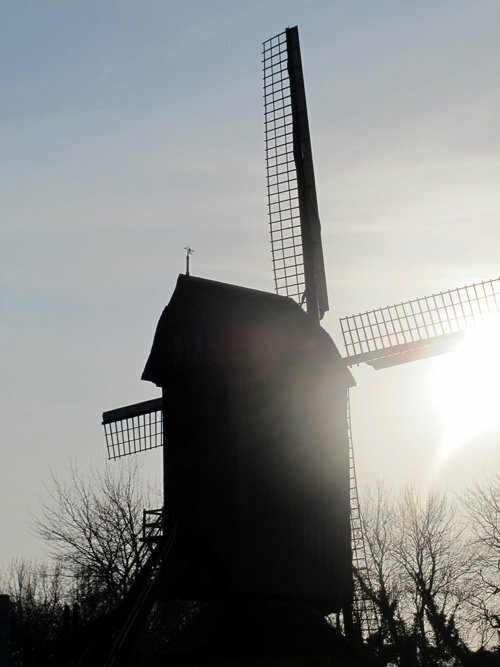 The Windmill – looks like the windmill featured in “War Horse”! Congrats on the sink. I can’t relate to those difficulties. As I said in earlier post, I am going thru a remodel. I know you have difficulty with IKEA but I I used their planning software on website, gave me a 3D view and list of parts I need and then 5 minute drive to IKEA. Stainless steel apron 30 inch sink – $350 on overstock.com and shipping was minimal. Course I can’t get the chocolate sweet in the pic in Houston. 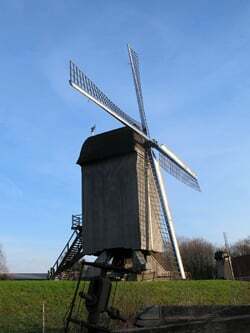 We have something that kinda looks like that but don’t think its the same. I don’t want want to go into the field with the cows to check. Thank you David, for introducing me to so many mouth watering foods! My food vocabulary is quite extensive, yet you manage to introduce me to so many new foods. Lovely chocolate pastries, and what nice looking sausages! : ) I will let you in on a little secret (which won’t be a secret for long) about Ikea. I can’t say for sure about the store in France, but in the U.S., Friday night is the time to go. I’m thinking it may be because normal, rational people are ready for a little R&R on Friday nights and the thought of going shopping for household items it the last thing on their minds. That pastry! I can only hope to dream about it all night long. I have a new admiration for the French after your posts. They must be a very tenacious people. And, did you know that about yourself :-). It took me six months to find the right farmhouse sink that did not break the bank. Well done David! Well, Ikea does have a couple pretty nice white porcelain farmhouse sinks, at least in the American market, but they don’t come with a great road trip. I thought I would never see the day the work was completed, and honestly, I didn’t. Seems as if so many things were left to complete, but don’t let me stress you out over my nightmare. Remember this, “Rome wasn’t built in a day.” You’ll make it through this and you’ll be the wiser for it. In the end, you will be thankful that you took the plunge. I love, love, love your blog! You are an amazing talent. Your renovation project sounds like a fun challenge. If you get stuck on anything, contact me, I’m an interior designer. Cheers! Lovely story, as per usual! I would like to (1) visit that city and (2) sample every one of the baked goods pictured here. Congratulations on the new sink! David, I notice that in addition to not revealing the appearance of the New Sink, you did not reveal where you found it. You said you found “a few bakeries and a nice charcuterie” inside Le Marché de Vieux-Lille, but there was no mention of …. a sink. Possibly Le Marché de Vieux-Lille is a red herring. Anticipatively awaiting the whole story. À propos des escargots, I was just reading about Jules Allix and his télégraphe escargotique for transmitting coded messages. All you need are two sympathetic snails, that is, snails who have become telepathic with each other after recently mating. Snail #1 at Location #1 is placed on a letter of a specially configured alphabet and Snail #2 at Location #2 is placed on the same letter of a corresponding alphabet, and voilà! You are so cruel, showing that Merveilleux, but not providing a recipe! I’ve googled, and come up with so many places talking about that store, but never a recipe! We don’t have anything like it here in Australia, and I love baking sweet things every few months. 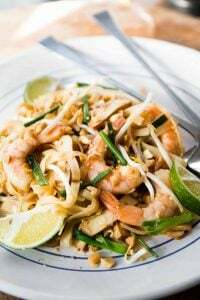 Please, can you find/make a recipe for us? It’d be greatly appreciated! As an interior designer, I was disappointed there wasn’t a picture of the sink, but I suppose that will be unveiled in the final installation. :) But thanks for all of the other tasty pics. I’m thinking I need to add mussels to the menu this week. I’ve actually just been drooling over a beautiful white ceramic sink in Ikea here in Sydney!! I can’t work out whether to get it or whether I’m going to end up with too many things smashed when they get dropped in there by children!! i received an email about paris pastry and I could not open it.. Plumbing Fixtures,etc load up wagon and drive back to Paris..or car ferry. Wait until April..Fly to New York..bring fixtures back on Queen Mary. Fly to New York, stay at the Pierre, Shop for Fixtures, Buy, have dinner at Le Cirque and go home. Look what Patsy and Edina did when they were looking for door handles.–but maybe you don’t get AB Fab in Paris. Good Luck. hi david, i just received you newsletter in my inbox. i cannot figure out how to view it as a main page. i tried clicking all over the page but did not work. can you help? thanks…i love your posts and am very excited to read the newsletter. Kerry: To subscribe to the newsletter, enter your e-mail address in the field/box just below the header, on the top right of the site. Once you do that, you’ll get an e-mail prompting you to confirm. Hampton: My contractor did recommend buying things in America (and I thought of going to England to get a sink) -but luckily I found one here. Or rather, in Lille. What a lovely daytrip! 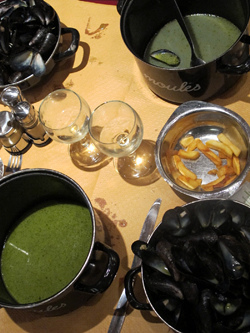 That “Merveilleux” looks a tad intimidating, the moules look delicious. Can’t wait to see the sink. What a wonderful day ! Congrats on the sink…can’t wait to see it ! What a terrific post! Having waited ages for a few bolts of fabric, I sympathize with your sink odyssey. And I am long overdue on thanking you for your many fine lessons; yours is my go to book for ice cream. Grazie mille! One last query – when can we see the sink? Or must we wait for the “total reveal”? Thank you, Guia and David I did and all went to Photo in my Hotmail.I will now go there to read and I also downloaded on my phone just in case. Congratulations on finding your sink! And honestly, three weeks doesn’t seem so bad. When I first moved to Manhattan, I spent 3 solid months searching for the right couch. Which of course, didn’t fit in the door of my apartment when it showed up; the delivery guys wanted to SAW AN ARM OFF. Wacky moving tales: not only the provenance of the French, no? 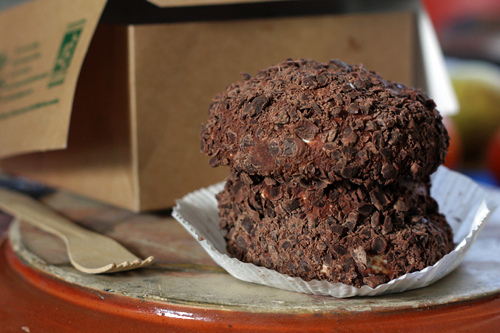 I could definitely go for some of those Merveilleux….they look like chocolately dinosaur egg deliciousness (but in the best way possible!). Good look with the kitchen! did you give your sink a name? you went through a lot to find just the right one. how will you christen it? A dear old friend would always reply “Impossible n’est pas français,” and if the worker/ sales associate/ clerk whatever had stayed awake even one day in school, this would bring forth a rueful smile, and generally also the result we were seeking. It is said that first time this was said, was by Napoléon to a reluctant general, who then saluted and went on to win. David, whatever you do, please do not get tile counter tops. 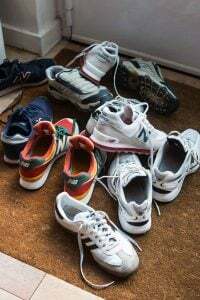 They are very hard to clean and you will regret it every day. Bon chance with with apartment! David, I am fascinated about your experience in renovating in Paris and the pictures along with the story. I thought you were exaggerating your renovation woes when I read in the NYTs Mag that Marc Newson had to move his design studio from Paris to London because the bureacratic red tape was impossible for him and his business! Love, love, love your posts. Hey, Dave. I’ve been a long time reader of your blog and truly envy your life in Paris. I look forward to stopping by each day to see if you’ve posted something new. I was lucky to visit Paris for a couple of weeks back in 2006 and still miss it everyday. I’m just curious, is your new place for you and Roman or does he maintain his own place? I know this has nothing to do with your current post, but just curious. I hope that one day I’ll have a French husband either in France or stateside. Like some other commenters, your post has left me dying to make and eat a merveilleux. 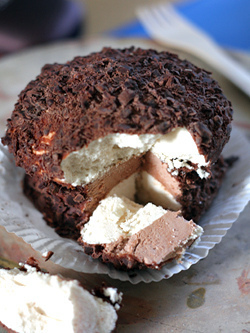 I think I’ve figured out from a few internet sources that its just whipped cream sandwiched between two meringue discs and then rolled in chocolate, but what I want to know is, what’s the chocolate creamy layer in the one in your photo? Please, help us, we must eat merveilleux! Reading this made me think longingly for the mussels i used to eat at Higgins Restaurant in Portland, Oregon. Served with buttered dark rye-bread and cooked in belgian ale and shallots. Adored the post! Would love a merveilleux recipe…or some recipe resources….Merci. I thought Lille was such a charming city. And all the cakes? C’etait incroyable! I gotta get my hands on those merveilleux!! Re the fries: why peel the potatoes? 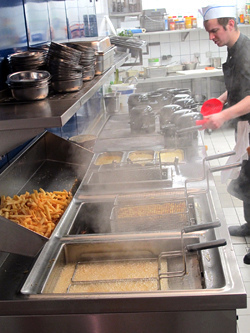 Just scrub – unpeeled fries are way tastier (plus they show that the potatoes were fresh). Regarding your comment: (One thought is that fixtures, like faucets and such, from America and the UK might not work in France. Does anyone know if that’s true or not?) 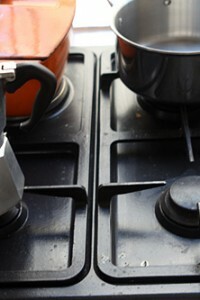 It just depends on what the openings in the sink allow and what will fit. If you do order the faucet from the UK or US (or anywhere else for that matter), just make sure you buy some extra washers that fit that specific faucet set. That way if you eventually get a little (faucet) leak or drips you’ll have the replacement washers on hand. What…and no picture of your sink? Sounds like a wonderful day. Glad you found your sink. It takes true talent to write about sinks and get all of us hooked! what fun… I spent a fun year abroad living in Tournai – just a half hour over the Belgian border from Lille. All the local cuisine you tasted were the very things that I remember most about food when I lived there… les gaufres (although I’d not tried the chicory cream filled ones! 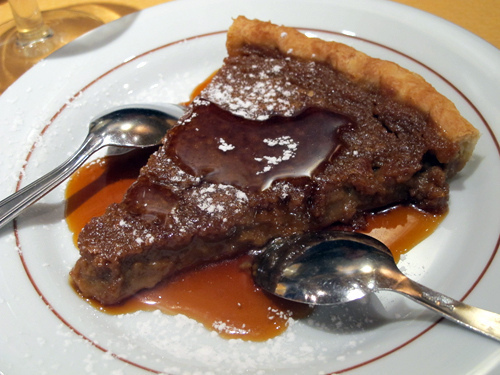 ), les moules-frites, and le tarte au sucre. Ah, all wonderful food memories! 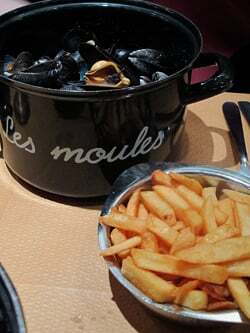 Moules-frites in Lille, that is a must! as for the market…. 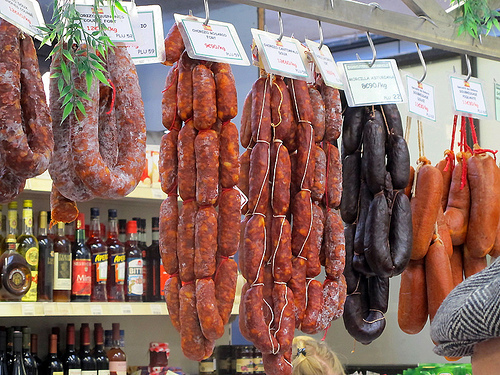 the stall with all the chorizos hanging is in the Marché de Wazemmes. I love it, cause it’s one of the few places in France (outside of Paris) where you can find really good Spanish “charcuterie” (chorizos, sobrasada, longaniza…) and cheeses. They also have lovely italian and portuguese stuff.